A typical example of consultancy services available to small and/or new production boat builders would be the design and engineering of this small cruising yacht for Timelsss Yachts, a UK based company building in China. This gaff cutter is based on a well-proven and highly successful concept that was re-designed by OCD for the 21st century and re-engineered using modern composite materials. The Timeless 22 Gaff Cutter is a fully equipped traditional short-haul cruiser yacht designed and built to RCD Classification B (offshore), CE marked to comply to all EU standards. with engineering completed to ISO 12215 and checked in-house using the Wolfson Hull Scant software. 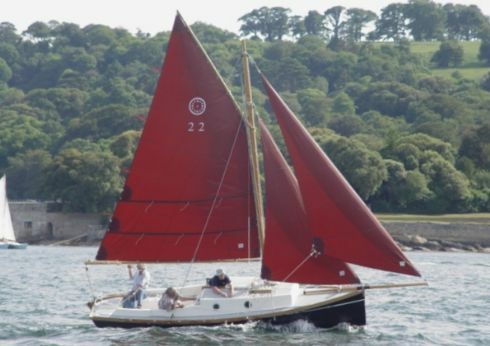 The first production boat was sailed around the Devon and Cornwall coast taking part in a television program about the joys of cruising, drinking and eating in the West Country. Commenting on his boat Chris Denham, of Denham Productions, said she was: "ridiculously fast and easy to handle, the fastest little boat I've sailed"
Owen Clarke Design went on to produce a 19' gentleman's motor launch design for Timeless, of which only the prototype example was built before production was swtiched to cruising catamarans.